Outraged that workers at Burr Oak Cemetery in Alsip dug up graves, dumped the bodies in a mass grave, and resold the plots, hundreds of Chicago area dead returned from the afterlife to stage protests. Authorities estimate there were about 21 such protests in and around Chicago. Trevor Washington, who's body was dumped into a mass gave, spoke at the Cicero protest in ghost form. "All my life I had to deal with racism and disrespect!" Said Washington. "I was denied a proper education, called (Expletive Deleted) and other terrible names. I was constantly turned away from well paying jobs because of the color of my skin. I was denied the right to vote. I was denied the right to use any Men's room. Now I had many happy moments, but after I died, I thought that I could finally find peace. Instead, my body was vandalized by a bunch of ghouls! Even in death, I can't get the respect I deserve!" While zombies rallied outside of Chicago's city hall, Mayor Daly met with his father, and several other representatives of Chicago's afterlife political machine. After the meeting, Daly made the following comment to The Babbler: "Chicago has always respected the dead. For the longest time we were the only city that recognized their right to vote. What happened in Alsip is an abomination. I have ordered the Chicago police department to kill anyone they catch harming any human remains. Then these criminals will have to face the wrath of my father!" In Lisle, 30 corpses rose from their graves and demanded Mayor Broda's presence. Thirty minutes into their rally, Trustee Kim Brondyke arrived, wearing running shoes and a running outfit. She apologized for Broda, saying that he was inspecting Lisle's new bunker with several SWAT officers, and couldn't attend the rally. She continued by saying that the Village of Lisle owns the cemetery, and is committed to protecting its residents. "No matter how desperate we may be for money, or how tempting the offers from developers might be, we will never sell out our deceased residents!" She said before vomiting at the sight of rotting corpses. She continued, "Excuse me. We are all proud to be residents of Lisle, and we want our bodies to remain here after we pass on. What happened in Alsip was an outrage, and the Village of Lisle will do everything in its power to make sure that such a crime ever happens here!" Brondyke asked the zombies to return to their graves because they were scaring the living residents. She then sprinted away from cemetery. Sources in the Lisle government say she was chosen to speak to the corpses because of her extensive marathon experience. Broda felt that she had the best chance of running away should zombies try to attack her. 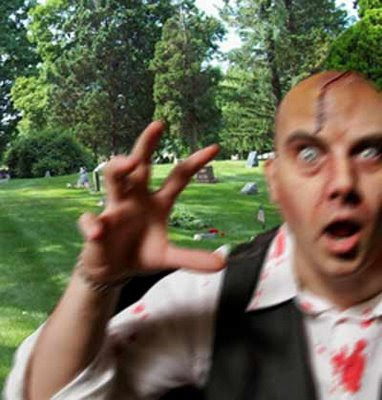 In Bolingbrook, 15 zombies marched from Broadman Cemetery to Mayor Roger Claar's home. Twenty police officers, and 10 Men in Blue met the undead protesters in front of Claar's house. Neighbors claim to have heard Claar talking to someone one the phone. "I've donated thousands of dollars to your church and now you tell me you can't turn the undead?" Some clam Claar shouted. "What kind of cleric are you?" A few minutes later, Claar opened a second story window and addressed the zombies. "Bonnie is my worst political enemy, and even she won't call me an opportunist grave robber! If she doesn't think I would harm your graves, then why should you? If you want to insure that I will never be tempted to sell you out, tell your survivors to donate to my campaign fund! Now go back to your graves. You guys are scaring my family!" According to authorities, all of Chicago's dead were back in their graves as of 12:01 AM on Sunday. Please don't click on my name in the above comment. I don't know why that URL copied, but it is way past NSFW. I very much apologize for the mistake, and for any offense that may be taken. I'm asking for The Bolingbrook editor to please delete the URL. I now have the one I wanted. It is not surprising that there is an uprising to demand fair treatment. It seems to me that the surprising thing is that the disenfranchised are only now speaking up about disinterments. I find all facets of the situation unacceptable. Also, is the Clow UFO base gearing up to celebrate Apollo 11's 40th anniversary? Have some parties already begun? A friend of mine a little bit north of Miami told me about some visitors that have surfaced too close to a number of vessels in The Bermuda Triangle. Even at altitude, the crafts appear to be unsteady. Can you confirm this? My personal opinion has always been that all visitors from other systems should not be permitted to go "off-road". They need to stay at Clow because most people aren't ready for them yet. Mayor Roger Claar abducted by aliens! Can the restaurant event save Bolingbrook?